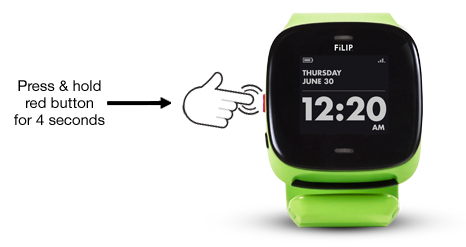 When the red button on the FiLIP is pressed for 4 seconds, FiLIP’s emergency mode is activated and the FiLIP will automatically call the primary contact (which is usually the mom or dad). If they do not answer, the FiLIP will then call the other emergency contacts stored in the FiLIP app until one of the contacts is successfully connected. When the emergency mode is initiated from a FiLIP, it records the call and surrounding sounds, starts tracking location info, and sends the parent notifications through the app.